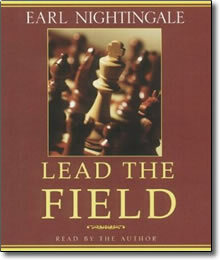 Lead the Field CDs by Earl Nightingale – Discount! Own the program that has changed more lives than any other. If the grass is greener on the other side … it’s probably getting better care. Success is not a matter of luck or circumstance. It’s not a matter of fate or the breaks you get or who you know. Success is a matter of sticking to a set of commonsense principles anyone can master. In Lead the Field, Earl Nightingale explains these guidelines: the magic word in life is ATTITUDE. It determines your actions, as well as the actions of others. It tells the world what you expect from it. When you accept responsibility for your attitude, you accept responsibility for your entire life. Hundreds of thousands of people have profited from the wisdom and savvy of Lead the Field! In fact, it has often been referred to as the “Program of Presidents” because so many top executives have incorporated Earl’s guidance and wisdom into their management philosophies. When you listen to this landmark program you’ll be awestruck by the simplicity and timelessness of Earl’s words and ideas. Lead the Field has arguably changed more lives and created more millionaires than any other program Nightingale-Conant has produced. Order it today, and start moving into the top 5% of the world’s earners!! Now, it’s your turn to bring positive changes to your own life, changes that will allow you to lead the field yourself!